On special occasions, you want to deliver restaurant quality sustenance to your family and friends, so which recipe do you choose that is neither time consuming, nor full of ingredients that you cannot find on short notice? Tuscan-style shrimp of course! It is elegant, classy, luscious and keto too. You can add Parmesan cheese at the end of cooking if you are consuming dairy, though it is perfectly acceptable (and delicious) to serve it without. 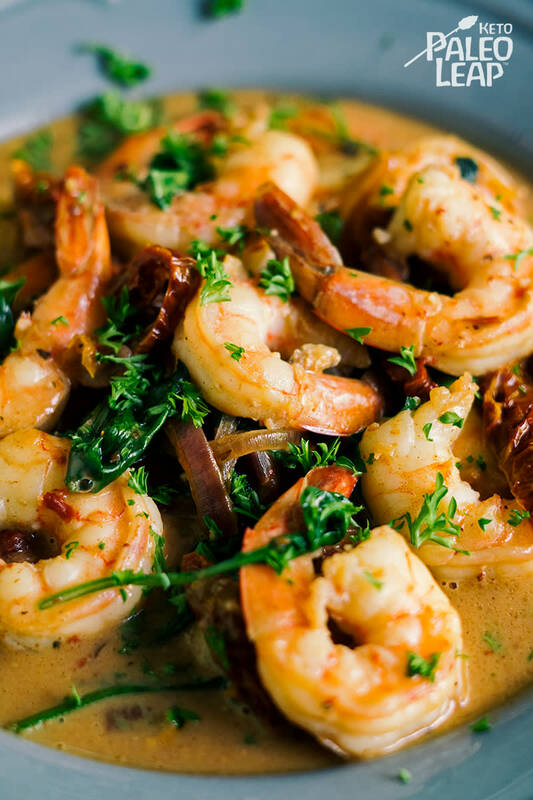 Recipes that include shrimp are quite versatile and very often low-carb too. For example, a bowl of spicy shrimp with sun-dried tomatoes also fits the keto guidelines. It is also easy to incorporate seafood with Asian flavors, such as lemongrass-skewered spicy shrimp, which includes chilies, lime and lemongrass. But, oh, the flavors of Italy! Those always pull at our heartstrings. The fragrant garlic, the delightful bites of sun-dried tomatoes, the fresh parsley… One can almost imagine the sun setting over the Tuscan landscape, a glass of wine in hand. Wait, can you drink vino and still be in ketosis? The short answer is yes, but you need to choose your alcohol wisely. In the case of wine, opt for dry or semi-dry bottles of the best organic quality you can find – and sip in moderation. Traditionally served over a bed of penne pasta or with a side of toasted bread, you can quickly let those items exit your imagination. Instead, you could speedily spiralize a zucchini or two for zoodles, which will make the meal complete – and completely delicious. Heat the coconut oil in a skillet over medium-heat. Cook the shrimp 2 to 3 minutes per side, until pink, and set aside. Add the onion and garlic to the skillet and cook until soft and fragrant, about 2 to 3 minutes. Pour in the chicken stock and stir until dissolved by half. Add in the sun-dried tomatoes, parsley and coconut milk. Bring the shrimp back to the pan and toss everything. Season to taste with salt and pepper. Next, add the spinach and cook 1 to 2 minutes until wilted. Serve the shrimp topped with additional fresh parsley.